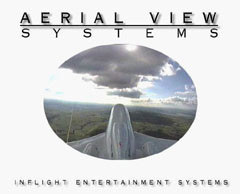 Aerial View systems needed to illustrate the capabilities of three types of cameras that mount on aircraft. The streaming video clips had to showcase the distinct functionality of their respective products: a super-vision camera, an auto-tilt camera, and an auto-zoom camera. The footage provided for each camera type encompassed numerous locations, weather conditions, altitudes, time of day, and type of aircraft. The voluminous video tapes were reviewed, logged, and pared down in order to integrate these broad circumstantial uses into captivating and informative presentations.